It's Red Nose Day today. Comic Relief has always been my favourite of all the charity days like this. I even remember the very first one back in the 1980s - I wrote a poem at school about it. I'm sure I still have it somwhere. Then there was the time a couple of friends and I ran around the town centre dressed in pyjamas and shaking a collection bucket at people. I have also enjoyed staying up until the early hours of the morning on Comic Relief night watching the show. I do love a bit of comedy and the sad bits about what the money is needed for always gets me donating. 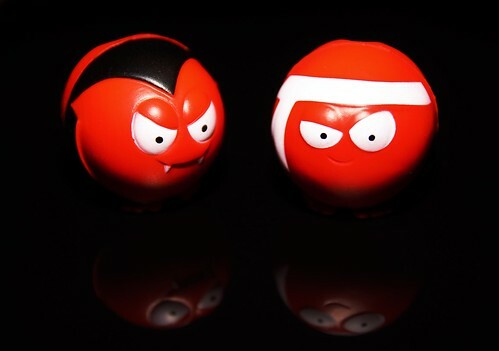 This year I think the majority of my donations have gone towards buying red noses. They have been so cunning and put nine different types of nose in sealed bags so you don't know what you are getting. Me and the kids (who love 'blind bags' anyway) have become a bit obessed with collecting the whole set. We now have all but Snotty Professor! Here are a beautifully photographed Snout Dracula and Karate Konk. I love how dramatic the photographer has manage to make a couple of rubber noses look. I especially like the reflection. Happy weekend and happy Red Nose Day everyone!